If you have read anything about Android, you will know that it is an open-source style platform, which means that development for the Android is pretty common, and many people have come up with some amazing things for it -- including custom ROMs. 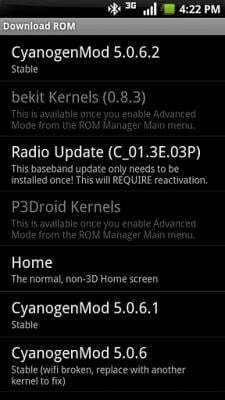 But the process and sheer number of available ROMs can be rather scary. Some great developers have created an application that essentially has become a one-stop shop for all your custom ROM needs. Read on after the break. Our forums are full of many different hacking and flashing-related questions, and to be quite honest, a lot of it comes down to people who don't understand or are just very scared to mess something up. (And that's certainly understandable) Coming from a background in which I have used many different smartphone devices, and loaded many versions of the OS that were not the original, to me it was not as scary. At first I started off doing things from my Mac, like downloading the files needed, transferring them to my memory card after renaming them and then flashing from the device. This method works out pretty well for people that know things like what the "root of the SD card" or how to flash a custom recovery are. Luckily, some of the Android experts were kind enough to develop an application for us that brings just about all of these options to us in quick and easy to use location. 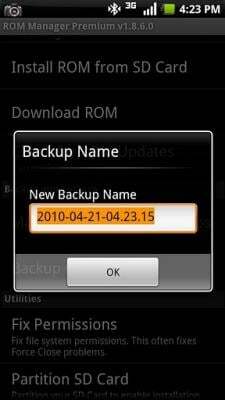 ROM Manager is a rather easy to use, yet feature packed application that will make flashing ROM's, adding themes, fonts, or creating a backup of your current ROM a breeze. The first thing you will notice when you open the application is the ability to flash to the Clockwork Recovery, which is one of the latest custom recovery images that seems to be working well and supported by many different developers. Beyond this you will notice that there are a lot of different names in the format of a list, these are all the various ROM developers you may be familiar with. Clicking on the name of the developer will bring you to where you are able to download the ROM of your choice. Some developers will have previous models along with current ones, and others will have just the most current revision of the ROM. Along with having various ROM's available in the app, some other developers are listed who have created themes, or other add-on's for these ROM's. Like with other platforms, people like to have custom themes, which allow their device to have a personal touch and not hold the generic look that you could find on just any device. Downloading and applying these themes, or font additions are as easy as downloading the ROM, all you have to do is select which you want to download, then download it, then reboot and it will apply itself, and when once the device has loaded you will now see your new theme. ROM Manager is available in the Android Marketplace [App | $3.99 Upgrade] . Yes, you'll need to be rooted. Keep in mind, modifications to your device such as rooting and flashing custom ROM's may void your warranty. Also, be sure to perform these modifications at your own risk. Be sure to visit the hacking forum of your respective device with any questions you may come across. Happy hacking!